This beautiful Yellow Lemon Chia Seed Cake is such a dream to have and as a bonus its an Eggless Vegetarian Recipe. A lot of you guys have asked me for Eggless Cakes and Dessert recipes and I have been working on developing some amazing foolproof recipes.If you haven’t yet tried my Eggless Mango Cake or Eggless Chocolate Cake then I swear you are missing something in life.These cakes are not consolation prizes cake as Eggless cakes tend to be.A lot of times eggless cakes can be dense and gummy but all the eggless cakes I have posted on this site have great crumb, texture and they genuinely do not need any eggs in them. The beauty of learning and mastering such a base sponge recipe is that the limits are endless! I have made the Summertime Mango Cake using this recipe as the base.You can change the tone of the cake by simply experimenting with the fruits, seeds,chocolate,frankly whatever you fancy! This recipe calls for lemons, which is not as easily available in India but you can use our desi Indian Lime too.Though lime and lemon are both citrus fruits and their names are often confused and used interchangeably,there is a nuanced between the flavour of the two.Lime juice is a lot more pungent and tart than the juice of a yellow Lemon- though their sizes are very different, if you are substituting the lime for lemon in this Lemon Chia Seed Cake recipe, use only one. In India, Chia seeds have been used in desserts since the time of Mughals in the Kulfi Falooda.It’s also soaked in water and had with a squeeze of lime in summer months.Though in the recent years it has garnered a great bit of attention from health food enthusiasts.In fact, I eat a lot a chia puddings myself. 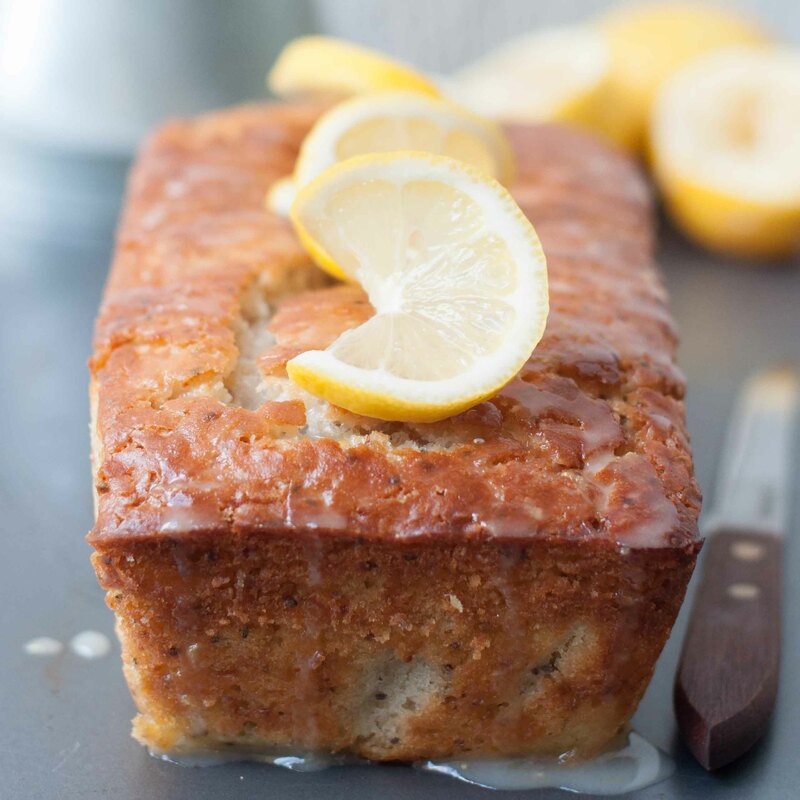 In this Lemon Chia Seed Cake, Chia plays the second fiddle but what a great role it is indeed.The lemon adds the much needed tartness in the recipe and the chia gives it the character it craves.These seeds, when baked swell up in size and crisp up and give this cake a one of a kind texture. Eggless Lemon Chia Seed Cake - Vegetarian Cake with Great Crumb, Soft Sponge with the tang of lemon and bite of Chia seeds. Combine all the wet ingredients-curd,oil,vanilla extract,milk with the vinegar and sugar in a bowl. Take half the flour mixture and mix well with the wet ingredients. Once incorporated add the rest and mix well. Pour the batter in a prepared pan. Bake at 180 degree for 20 minutes uncovered.Cover with foil and continue baking for another 10 minutes.Test the cake with a skewer,If it comes out clean(or with crumbs) remove from the oven or keep baking for 5-8 minute more. Other Eggless Cakes that you will absolutely love!